Sanjiv Samant is Managing Director and Group Head of Technology, Media and Telecommunications (including growth industries Technology, Media, Telecommunications, Healthcare and Sustainability). Sanjiv has over 20 years of investment banking experience providing financial and M&A advisory services to a wide range of growth companies. During this time he has developed a strong reputation, relationships and profile, particularly in the technology sector. 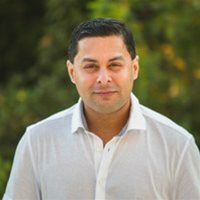 Most recently, Sanjiv was Head of the Technology, Media & Telecom group at Canaccord Genuity and was one of the original partners at Genuity Capital Markets. Previous to this, Sanjiv spent a combined ten years in the Communications and Technology practices at RBC Capital Markets and CIBC World Markets. Sanjiv has an MBA from the Schulich School of Business at York University, an LL.B. from Osgoode Hall Law School and a Bachelor of Arts (Economics) from the University of Western Ontario. Sanjiv also holds a Chartered Financial Analyst designation.